Ald Velothi is a small harbor north of Gnisis. Around 2E 583, the site featured a public pier and a modest Redoran-style private estate called Ald Velothi Harbor House. 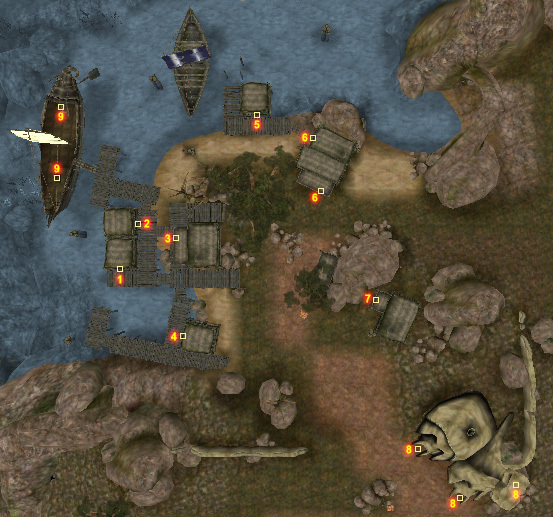 By 3E 427, House Redoran had taken possession of the harbor and converted it into a military outpost. There are few services, apart from some poor traders and a smith, and no means of fast transport to reach it. The settlement's principal structure is a Redoran watch-tower, and there is an outcast Ashlander camp directly south of the post, atop a hill. A large Daedric Shrine of Ashalmawia is directly east and visible from the village. The Redoran Lord (possibly Arethan Mandas) hasn't been seen in a while, but the Redoran Guards and his reluctant Hetman Theldyn Virith remain. Around town, three slave hunters are looking for a runaway slave. Orero Omothan is a blacksmith who is selling much-needed repair hammers in front of the Outpost. Inside, the trader Sedam Omalen has a selection of wares and arrows. Downstairs, you can get training from Lauravenya, a mage in the Imperial Cult, and there is a Shrine of the Tribunal. The Hetman Theldyn Virith is a quest giver for House Redoran. Small desolate fishing huts surround the harbor. 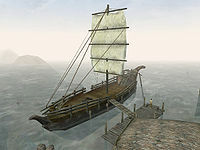 Galyn Arvel is waiting in front of the ship Fair Helas which is moored to the small docks. People have some trouble here with an old slaughterfish. While there are two ships in port, neither of them provides transportation. There is no fast-travel at all here. A dirt trail leads northeast to Khuul. A pass leads south over gorges to Gnisis. The runaway slave J'Saddha is hiding near Ashalmawia, due east of town. The trail west will get you to a Dwemer bridge and the ruins of Arkngthunch-Sturdumz. The Amulet of Shadows can be acquired from a questionable lady and her companion on the road to Gnisis. If you are higher level, Ashalmawia holds some interesting loot.